Sometimes you need something to pick you up and make you feel better. No matter the mood I'm in, quotes make me feel better. They inspire me, motivate me, uplift me – they raise my energy so that it's easier for me to manifest what I want. 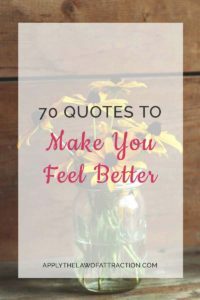 I'd love it if you could share quotes that make you feel better in the comments below – because I'd like this page to become a fantastic resource we can all come back to when we want to feel better. So what quotes do you have taped on your computer or wall at home? What quotes have you highlighted in your favorite book? Thanks for sharing, Jay! The quotes are great! Here is a great one for you Elizabeth. This one is money when you recognize how profound the statement really is. Circumstances don’t MATTER only state of being MATTERS. When you recognize how accurate it is you can use it to easily break free from the current experience and recognize nothing creates your physical experience other than your state of being and you can change anything instantaneously. That’s a great one! Thanks for sharing!